Of course it will feature examples tenuously related to animals. For console apps this is in the main method of Program.cs. For MVC and Web API apps this is in Startup.cs. For class libraries it is difficult to include dependency injection in the library itself as these have no defined entry point. One approach is to rely on the calling application to wire up the dependencies. For WebForms apps it is possible to setup the DI container in the Global.asax Application_Start method however it's a bit more complicated. 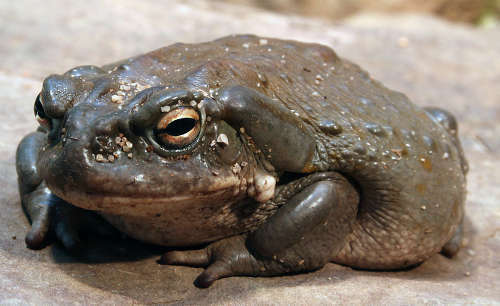 In this example we're going to begin building a console app which simulates an ecosystem of toads. This is written to allow constructor injection of both the logger and the class which provides the settings for the simulation. The console logger contains a per instance string so we can see exactly where the logger is getting called from and this will help us to understand the difference between object scopes later. It also records its hashcode (uniquely identifying integer) as an extra tool to understand object scope. Apart from the code in the main method the rest of the classes will not change from now on. Even with this very simple example we can see that manually creating the dependencies to inject through the code is going to become a lot of work. This is why we turn to a dependency injection library. Where we have lots of interfaces or abstract classes to bind, the binding code can quickly become repetitive. Instead we can use convention based configuration. 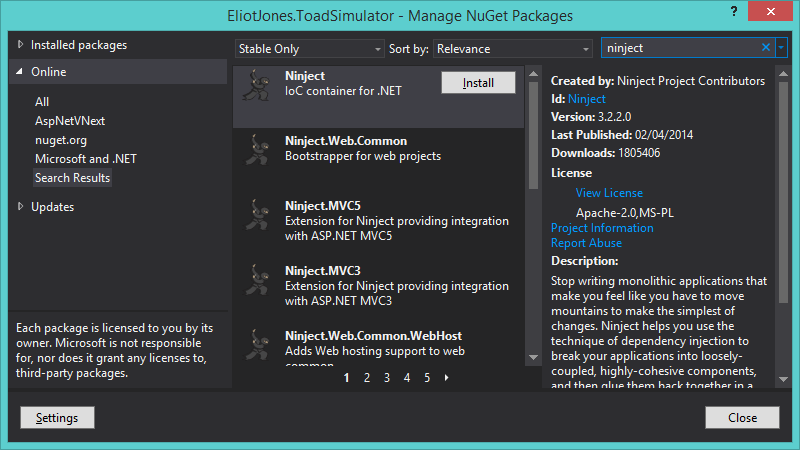 To do this in Ninject we need to add another reference from NuGet. Install the ninject.extensions.conventions package. The kernel can now be bound using lambda expressions. The Unity docs located here are great and go through using Unity with Convention based configuration and using Unity with WCF, Webforms and other more advanced use cases. The SimpleInjector docs located here are very much improved from before and are easy to follow. The StructureMap documentation here is the easiest to follow. This guide shows how the syntax changes between different DI libraries but the concepts remain the same. It does not provide any detail on advanced usage of DI libraries however should hopefully provide a quick start when changing between DI library syntax.